The State of Maryland is giving away hundreds of dollars to those who open a college investment fund. The General Assembly approved a bill that would fund the initiative called Save4College Contribution Program . Maryland residents who open a Maryland 529 College Investment Plan and meet a certain income requirement are eligible for a contribution of up to $250 per year. The accounts must have been opened after December 31, 2016 and before the June 1 deadline. To be eligible, account holders must also make a minimum contribution of $25, $100, or $250, based on your household income, between July 1 and November 1. "It's a really great way to get that jump start on college," said Michelle Winner, public relations and marketing program manager for Maryland 529. "You have to either be a single-filer making less than $112,500 or a joint-filer making less than $175,000." The program is now in its second year. Even if you received the grant last year, you could get it again as long as you still qualify and the fund doesn't run out. The funding is limited to $3,000,000 in fiscal year 2019. Aside from the free money, there's a major financial advantage to saving early. If you invest $85 per month for the next 15 years with a rate of return of 6 percent, you can reach your goal of $25,000 by only paying $15,300 out-of-pocket. However, if you were to take out a $25,000 loan, pay around $300 a month for 10 years, with 7 percent interest, you're paying nearly $35,000 out-of-pocket. These values may vary. T. Rowe Price, manager of Maryland 529 plans, also factors in program fees, inflation, and interest accrued during college. 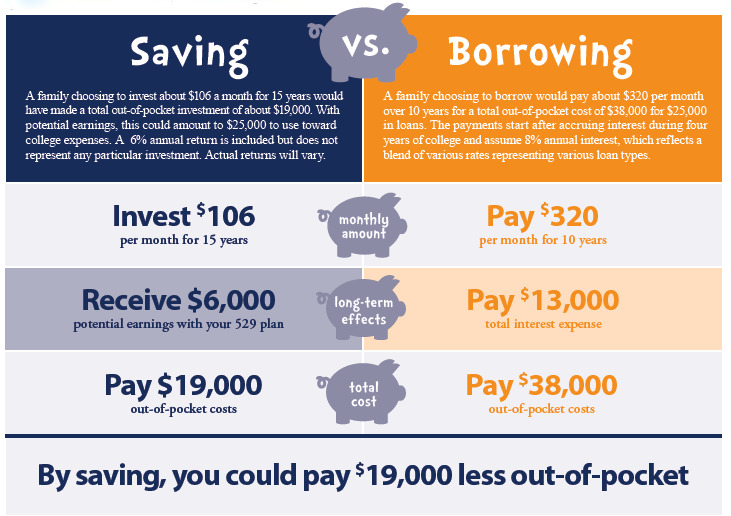 "Saving for college now versus borrowing down the road, you literally can cut your out-of-pocket cost in half simply by saving now, investing that money into a 529 plan," said Winner. Even if you don't have kids, you can still apply. The plan requires the beneficiary to be a Maryland resident, however, you can change the beneficiary down the road. A new law could potentially alter the terms of the Save4College Contribution Program. This year, the General Assembly passed a bill that would increase the contribution to $500 for individual applicants making at least $50,000 but less than $87,500, and couples making at least $75,000 but less than $125,000. The account holder would need to fund their account with the required contribution on or before November 1 of each year. Once approved, the state contribution will be deposited in the account by December 31. Maryland Governor Larry Hogan has not yet signed the bill, but if and when he does, the changes would take effect on June 1 of this year. And while the $250 bonus only comes with the investment plan, Maryland 529 has another plan that allows parents to lock-in today's tuition prices with the prepaid college trust. For more information, click here . If you're given the contribution, you won't be able to take the tax deduction. And with the new federal tax law, account holders can now use up to $10,000 of their Maryland 529 money for K-12 tuition. Maryland 529 also launched a new giving portal. It's similar to a GoFundMe account where it's easy for family members and friends to donate toward your child's future. It's called the GoTuition Gifting Portal . You can share the link with whomever for whatever holiday, event, or occasion and the money is directly deposited into the Maryland College Investment Plan account. All donations are tax-deductible.